The majority of poaching incidents that make the news involve well-known wildlife like elephants and rhinoceros. But the vast majority of poaching throughout the world is of small- and medium-sized game that are killed for their meat. The meat may supplement or be the primary source of nourishment for people living in destitution or in isolated rural communities lacking significant access to regional trade (page 3). This meat is often called “bushmeat” and is defined by the Convention on Biological Diversity as any non-domesticated animal, including turtles and amphibians, killed for its meat. This definition excludes fish, but they are also killed for their protein and are killed by subsistence poachers. There are millions of people around the world who depend on the local environment for basic resources. Some people that live in rural parts of Cambodia, India, Brazil, and Peru gather wood, resin, and other valuable forest products for trade to other markets so that they can then purchase the items that they want. Over-exploitation of the forests’ resources (page 2) impacts the long-term sustainability of nearby human settlements, the forest and surrounding regions, and the wildlife within the forest. But for many rural people forest products and bush meat are a major source of income and studies have suggested that even illegal subsistence poaching can eradicate severe poverty (page 2) by contributing to local rural economies (page 127-128). Bushmeat is also a major source of protein. Urban populations in Central Africa consume 3 to 120 grams of meat daily while hunter-gatherers consume 50 to 216 grams of meat each day (page 129). Many provincial and tribal communities, especially in Kenya and South Africa, have land usage rights that permit traditional hunting of wildlife. Hunting small- and medium-sized game such as the many species of antelopes allows them to fulfill their traditional lifestyle and does very little to impact the local ecosystem because they are only taking what they need. However subsistence poachers take this one step too far and hunt on property that is not their own or hunt protected wildlife species such as sable antelope and elephants. 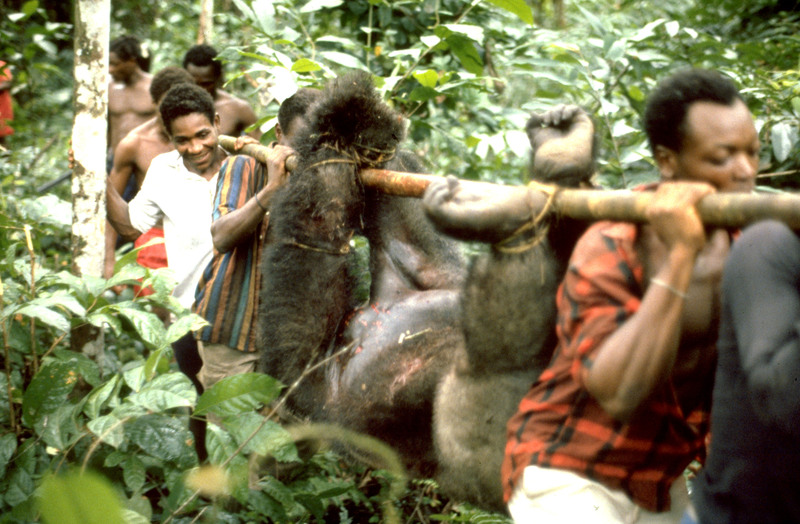 In Central Africa the western gorilla is also illegally hunted. Subsistence poachers may rely on traditional means of hunting using poisoned arrows or hunting dogs, or use modern weapons and traps, but know that they are hunting illegally. Poachers in criminal syndicates, rebel militias, and self-employed commercial poachers may also illegally kill animals for bushmeat while they are on multi-day poaching expeditions (page 29) for high-value wildlife such as elephant or rhinoceros. Billions of kilograms of bushmeat (page 127) are consumed in Africa’s Congo Basin each year. In rural parts of the Amazon bushmeat and fish (page 14) are both for self-consumption and for trade and are identified as contributing to individual household incomes (page 2). As rural communities in the Congo Basin are modernized and brought to conform with larger, regional or national laws, it can force a substantial change in the lives of people who have only ever known hunting and never considered the prospect of hunting specific animals as being immoral or illegal. One concern that traditional hunting and subsistence poaching raises is whether such activities are morally and environmentally permissible and will provide long-term food security for a group with no other prospects for subsistence (page 124). In some countries concessions are made for Inuit, Nunavut, and other peoples who hunt seals or whales for traditional purposes or to fulfill the traditional livelihoods that their people adhere to. In other countries few considerations are made for traditional ways of subsistence and the bushmeat trade is illegal, but laws are not heavily enforced. Subsistence farmers are individuals in a settled community who manually farm the land or raise livestock. They do not use tractors or other tools of large-scale agriculture to farm and do not use intensive farming techniques. Depending on the region they may farm on communal land or in areas designated for farming, but often do so without fences or other means of restricting access to their property. This can lead to instances of wildlife encroaching on human settlements which can put the people in the community at risk of hyena attack or bring them into contact with baboons, territorial male elephants, and other wildlife. This contact can result in direct human-wildlife conflict and the local people may feel the need to injure or kill an elephant that is raiding their crops or to kill predators that may or may not be responsible for killing their livestock. These are not instances of poaching and are classified as human-wildlife conflict, even if the animal killed is a protected species. One solution to loss of livestock has been to implement a predator compensation plan which reimburses people for livestock lost to lions and other predators. 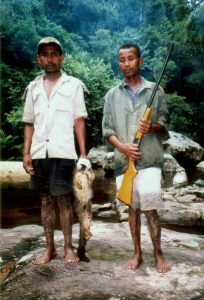 Many traditional peoples uphold the cultural values of their ancestors by hunting certain species of wildlife and by taking only what they need. Even though these people are within easy reach of sources of elephant ivory and rhino horn they have chosen a way of life that requires coexistence with local wildlife. It is uncommon for pastoral or tribal people to kill an elephant or rhino for any purpose. Those that do are unlikely to take the ivory or rhino horn to sell to wildlife traffickers because it goes against their values and respect for the animal. In Kenya where elephants have been killed as a result of human-wildlife conflict the ivory tusks are found still attached. Civil war, rebel insurgencies, and disease are having a dramatic impact on both human and wildlife populations in the region. As living conditions become difficult traditional sources of bushmeat are beginning to also effect the wildlife populations. In particular the western gorilla, a protected species in the Congo, has been under threat of disease, possibly ebola; warfare; and bushmeat poaching as local people struggle to survive. The Republic of Congo is one of several African nations to draft a National CITES Bushmeat Action Plan to promote a better understanding and management of the bushmeat trade. The protein supply for citizens in the Republic of Congo in 2000 was estimated to be 89 grams (3.14 ounces) per person per day or 64.3 kg (141.8 pounds) per year (page 74). That year the estimated availability of exploited bushmeat to the country was 189,234.9 tonnes (page 74), about 44.3% of the country’s annual protein availability, and is expected to nearly double by 2020. However as a result of over-exploitation of wildlife, insects, and other bushmeat protein sources, the estimated supply of bushmeat protein will fall and create an inevitable, dire situation for those reliant upon these protein sources for survival (pages 74, 75). The Big Life foundation has a livestock compensation program to discourage pro-active and reactive killing of predators that might kill cattle and other livestock. This has worked to curb unnecessary killings of lions, leopards, and cheetah while also making sure that the community does not starve for their act of wildlife conservation. While illegal wildlife killings by subsistence farmers do still happen they are held accountable both to their community and to the group that guarantees reimbursement for wildlife attacks on livestock. Subsistence farmers that graze their livestock within the boundaries of national parks or protected areas are not only committing a crime but are negatively impacting the local environment (page 15). It is understandable that with limited resources shepherds would want to make use of free food for their livestock, however this creates additional competition for food among wildlife and their domesticated cousins and also impacts the grassland that many species call their home. The Mali Elephant Project operates in a region where humans have to coexist with wildlife and must share limited resources. In 2006 programs were initiated to work with the local community on elephant conservation and in the course of understanding how to conserve the environment for the elephants objectives were set for conserving the land for the people. In 2009 it was discovered that wealthy Malians (watch the full TEDx video here) were taking their tens of thousands of cattle deep into land that did not belong to them and eating and drinking all the resources the land provided. By fixing this imbalance in resource use, and some funding from the outside to support water-restoration projects, a semblance of environmental balance was restored.